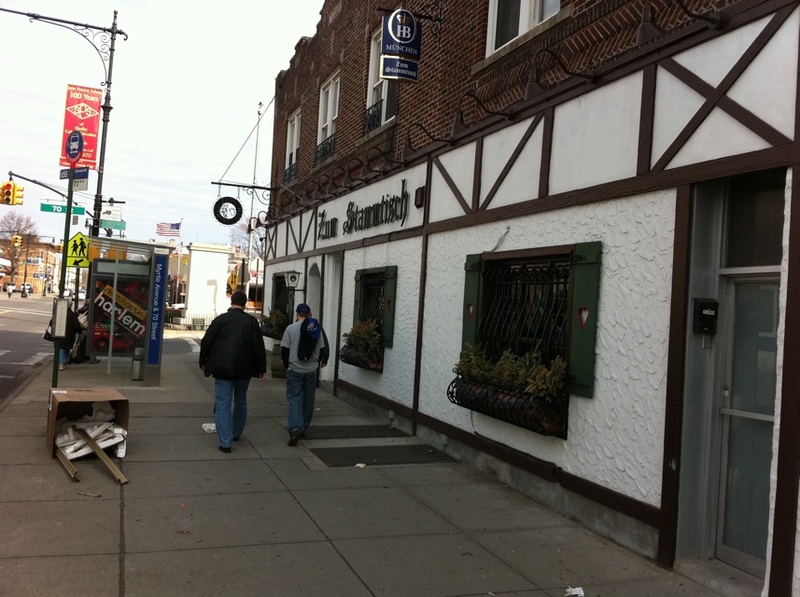 It’s A Long Way To Get To Zum Stammtisch From Manhattan, But If You’re Looking For Good Beer And A Good Time… . After sampling and loving the top notch wursts at Hallo Berlin my affair with delicious German food was sufficiently rekindled to engage in what is for me a considerable adventure: leaving Manhattan island. Generally, I very rarely leave Manhattan. Like many of the borough, I have it somewhere in my primitive brain that it is not a river but some kind of cliff that surrounds the island. If I do travel off Manhattan for food generally it is to the peerless Peter Luger’s. I am eager to put together an excursion to Flushing for Korean BBQ. However, there already was one target in mind: Zum Stammtisch, My buddy Doug thoughtfully suggested we get a Zipcar, and with a crew of affable fellows we set off on our quest for Bavarian delights. Approaching the door after a lengthy journey. 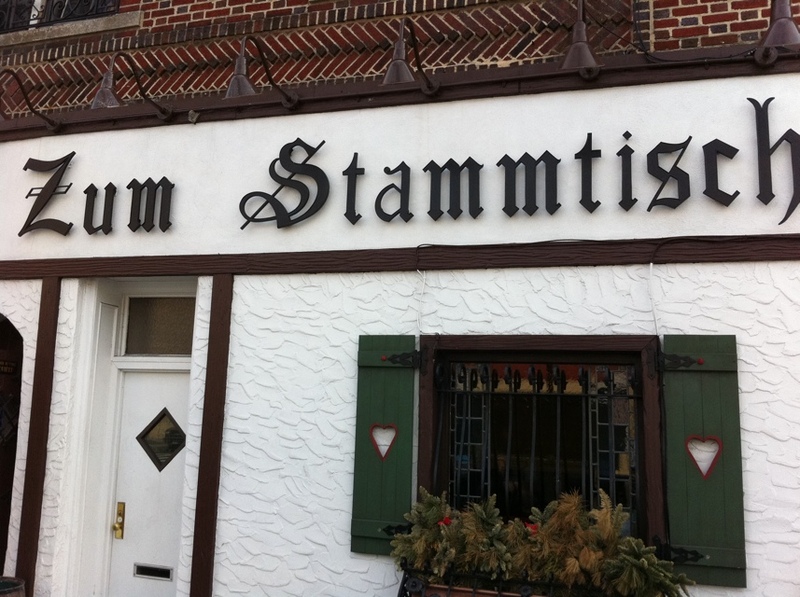 The first thing I’ll say about Zum Stammtisch is that if you’re trying to get to it from Manhattan, it’s a pain. I am sure we took less than the best possible route – at one point our driver inadvertently turned the wrong way down a one-way street, for example – but that’s Queens for the uninitiated for you. All in all, it took us at least an hour to get there. 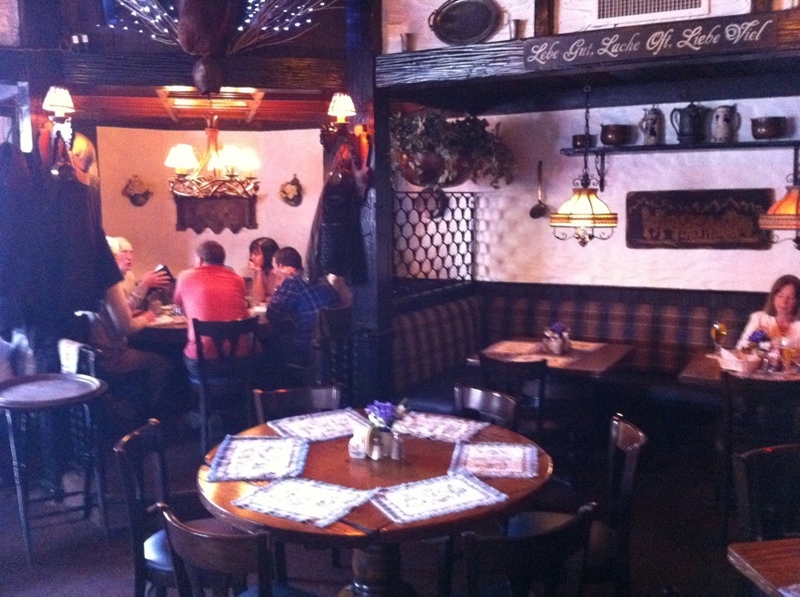 Bavarian interior, plenty of wood. We eventually landed, though, and there was some German music playing softly in the background of the Bavarian-themed interior. The waitresses were wearing dirndls (traditional outfits) and were pleasant, knowledgeable and direct. A pretzel. Pretty darn big. 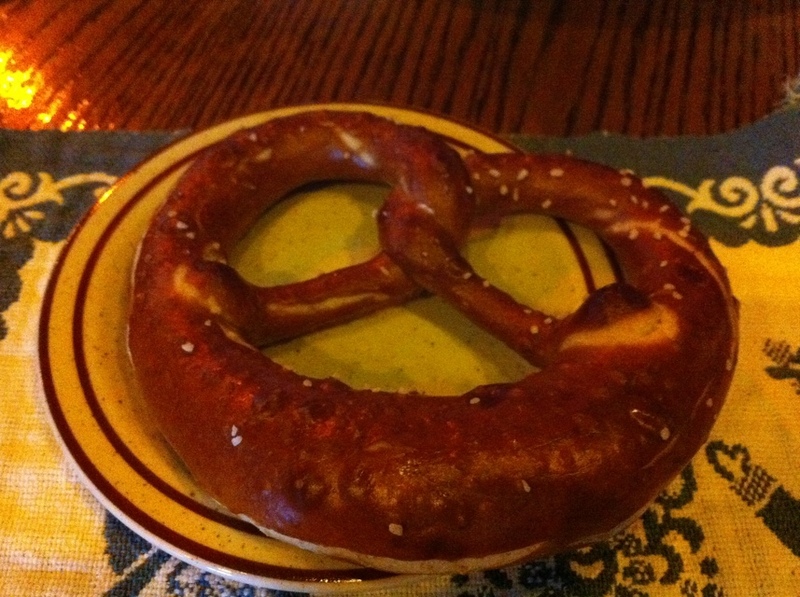 The first thing the crew was treated to was a serving of pretzels which greeted us at the table. They are the fat, doughy Bavarian kind, naturally, and were nice and warm. That said, they were also a bit tough, and I wasn’t sure if they were the freshest ever. Weihenstephan Kristall Weissbier. Delicious, effervescent and crisp. Of course, then it was necessary to drink some beer. They have an excellent selection. 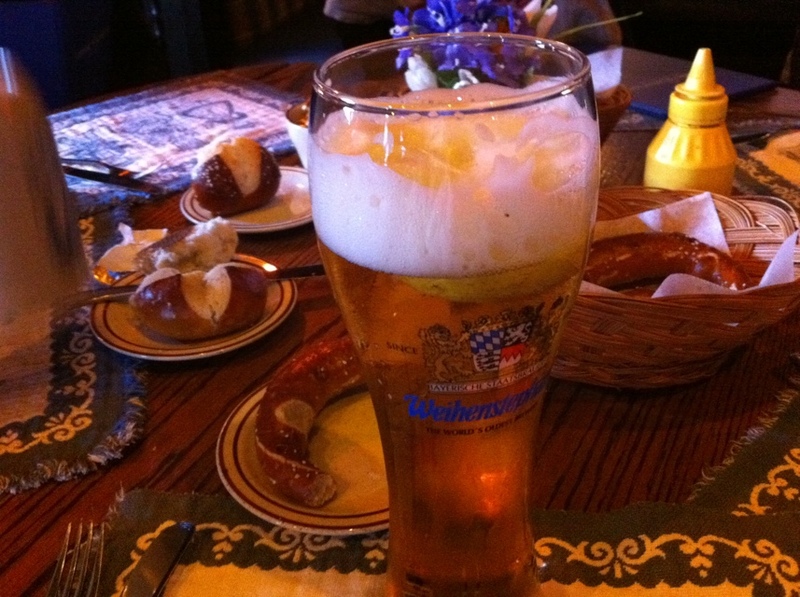 The one I got – Weihenstephan Kristall Weissbier – was delicious and crisp, and almost evoked a faint cider note to me. I'm not going to lie: I'd've liked it better if they weren't pre-cut. But they were delicious. 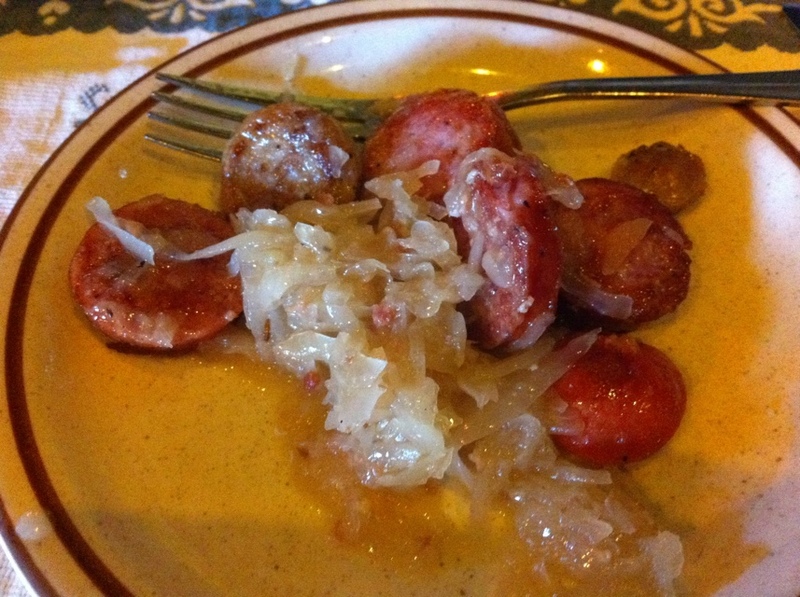 We got an order of wursts for the table – the Bayerische Bauren Platte. I was surprised to see the wursts served sliced up. Not only were they served sliced, the individual slices had been grilled a bit. Personally, I was a little sorry that they weren’t served whole for us to cut up and eat in fatter bites. By serving them in thin slices they don’t let you get to fully appreciate the wurst’s texture (as they do at Hallo Berlin). That said, the brat was delicious, and the kraut was amazing. It had a sweeter flavor than you typically get. My buddy Doug is pals with the place’s owner, who came by to shake hands and pay us a visit. He seems a great guy and we were all glad to meet him. 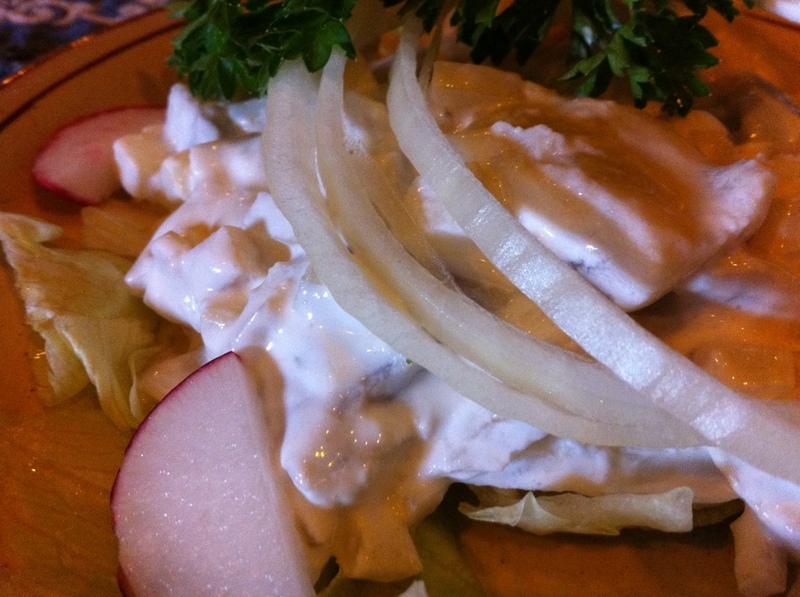 When I saw they had pickled herring in cream sauce on the menu, it was necessary to try it. I’ve usually only gotten it from three places: Murray’s, Barney Greengrass, or possibly Zabar’s. To see it on a menu, I jumped. It was delicious. The herring was cut into slightly smaller pieces than I get elsewhere, and the cream sauce was plenty sweet. The onions were also delicious. When I saw it, I was worried. But the flavor delivered. 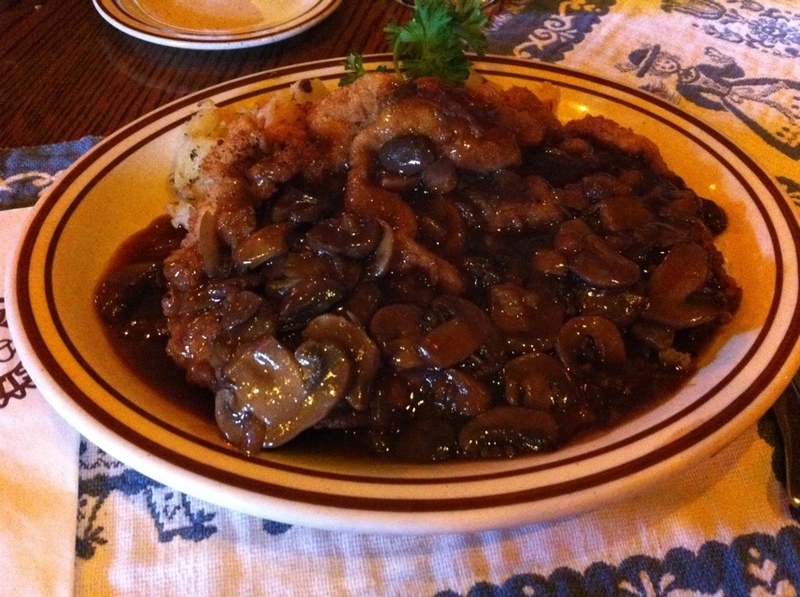 For a main course, I opted for the veal schnitzel in mushroom sauce (a Jagerschnitzel). The fried coating around the schnitz is much thicker than one gets at, say, Schnitzel & Things. 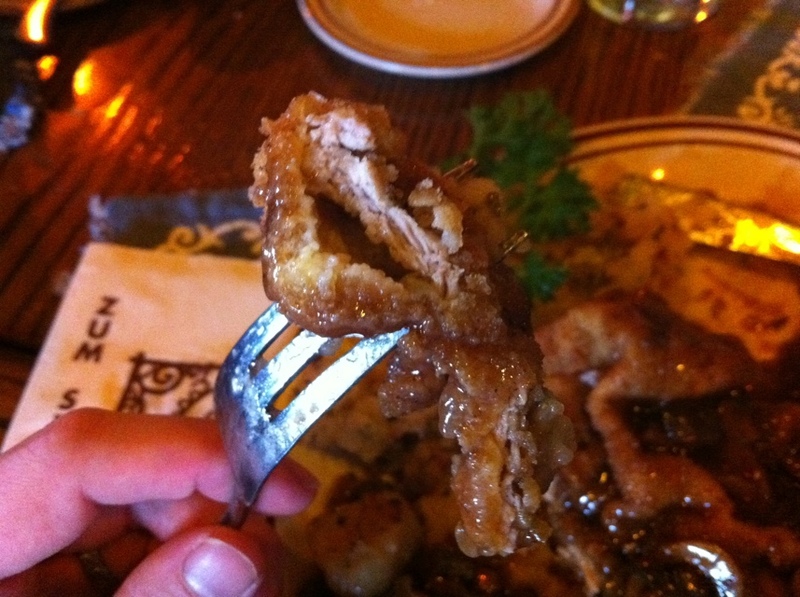 The sauce was actually good – I was worried it would drown out the schnitz flavor, but it complemented it well. This shot really shows you the thickness of the fried coating. It was a slightly thick sauce, with a faint red wine note, and of course plenty of mushrooms. The home fries were good and garlicky. The portion size is for people with appetites, that’s for sure. 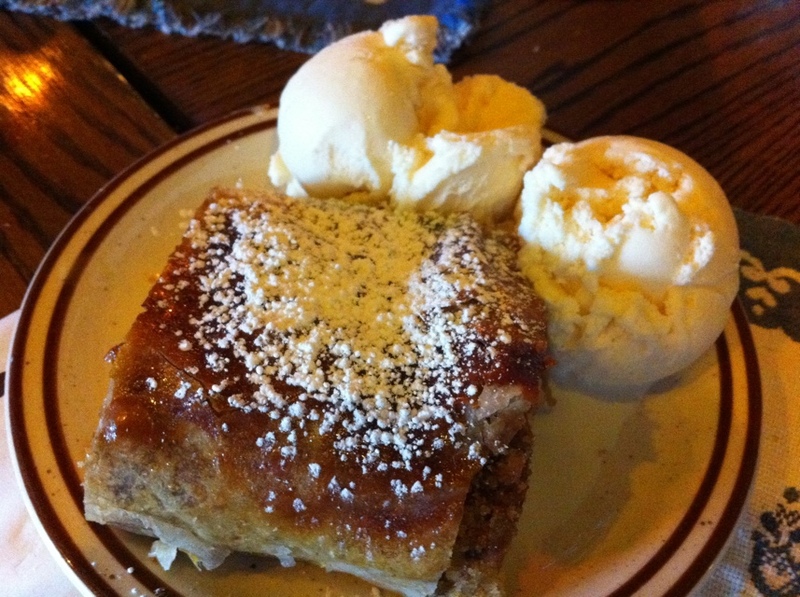 For dessert, we got the strudel, which as it turns out was the best damn thing we ate at the meal. Everything else had been fine, I’m not knocking it, I’m just saying the warm strudel with its flaky pastry wrap, layer of crumble inside and powdered sugar topping, was nuts. 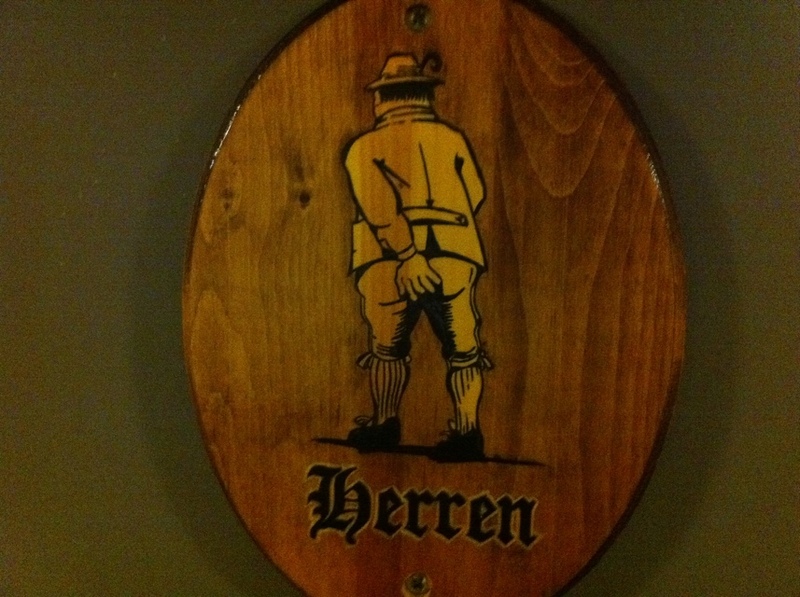 One last note: I really could’ve done without the image on the door to the men’s room. I don’t know if I’ll be be going to Zum Stammtisch again any time soon. It’s a long way to go for a Manhattanite like me, and if I want wursts, there’s Hallo Berlin. The food was fine. The beer was fantastic, and the company was great. Conclusion: It’s a damn good spot for a good time.